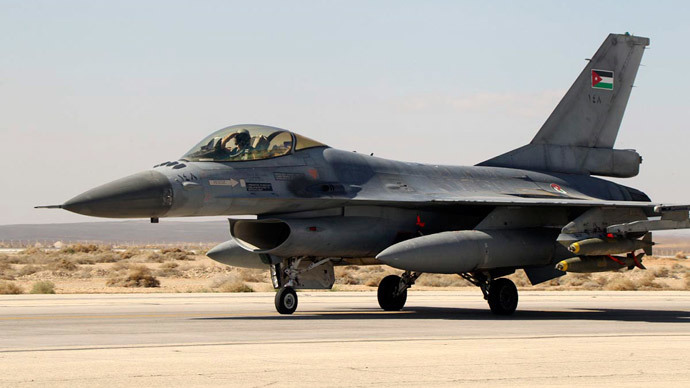 Jordan has promised to strike the Islamic State with “everything we have,” sending dozens of fighter jets to target the militant group’s positions in retaliation to the brutal murder of a captured Jordanian pilot. So far, the strikes have reportedly targeted the Islamic State’s ammunition depots, hideouts, and training camps throughout Syria. Jordan had vowed an “earth-shaking” response after Islamic State militants released a video which appeared to show pilot Mouath al-Kasaesbeh being burned alive in a cage. A US official, who spoke to Reuters anonymously, said that the strikes took place near the Syrian city of Raqqa, an Islamic State stronghold where al-Kasaesbeh was executed. Jordan’s King Abdullah II, dubbed the “warrior king” after 35 years of military service, pledged that the country would start playing a larger role in the US-led military collation against the extremist Sunni group that has captured huge areas of Iraq and Syria since last summer. Jordan also responded by hanging two Al-Qaeda prisoners early Wednesday morning, hours after the video of al-Kasaebeh’s execution video was released. Earlier, Amman had promised to trade one of the prisoners, Sajida al-Rishawi, who had been sentenced to death for her role in a hotel bombing which killed sixty, in exchange for the pilot. However, the deal was repeatedly put on hold as the Islamic State refused to provide proof that the pilot was still alive. On Thursday, Jordanian authorities released imprisoned Al-Qaeda spiritual leader Sheikh Abu Mohammad al-Maqdisi, Reuters reports. Al-Maqdisi was reportedly set free in the hopes that he would denounce the execution of the pilot and speak out against Islamic State militants.